A Quick Overnighter and Test of the Thermarest Uberlite. Discussion in 'Trips Reports' started by The Cumbrian, Apr 16, 2019 at 12:05 AM. 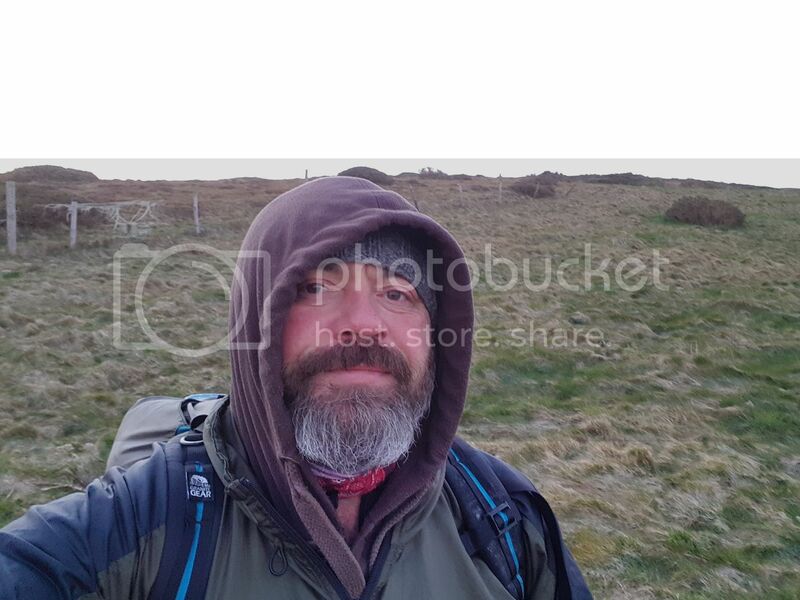 I found myself free on Friday night, so I packed up and headed out to the northern end of the Clwydian hills, which are the closest hills to me at the moment. 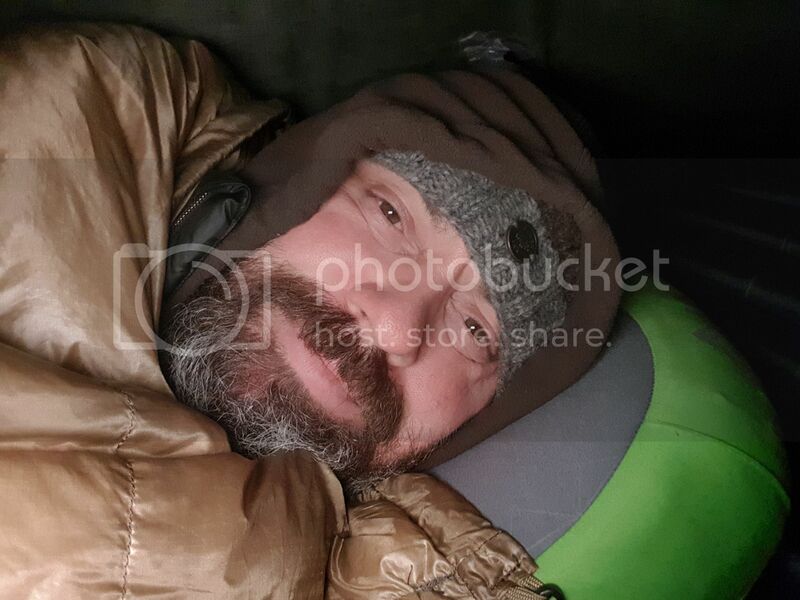 I wanted a night out, and to try my new Thermarest Uberlite for the first time. The forecast was relatively clear and breezy, so I wasn't expecting to push the mat's boundaries. The first surprise of trip came when the Zpacks pole extender broke in the moderate breeze. No real problem, I just pulled the Altaplex closer to the ground with the shorter pile length. With the slight angle of the pitch though, I did wake up a couple of times in the night with my face pressed against the midge netting. I was comfortable all night and only woke up because of the previously mentioned angle of the pitch. I was surprised to wake in the morning to a heavy frost though. If I'd known that it was going to be that cold, I would probably have taken a mat with a higher R value. The mat proved to be adequate for the conditions though. It didn't feel warm, but I didn't feel as though my body warmth was being sucked out of me either. I'm quite a warm sleeper, and I'm now confident to use it on frosty nights, just as long as the ground isn't frozen when I pitch camp. I think that would push it beyond it's limits. Taz38, fluffkitten, cathyjc and 9 others like this. Manufacturing fault or UK weather? That is interesting, ta for posting this information. Is there any way you could guess the temp-frosty implies around 1-2 degrees would you say? May I ask what quilt or bag (and rating) did you use and sleep gear etc? This is the first known use of this mat I have come across and is really interesting given the temp you used it. Wondering if your sleep gear somehow compensated for the mat's low R rating. "I was surprised to wake in the morning to a heavy frost though. If I'd known that it was going to be that cold, I would probably have taken a mat with a higher R value." Could you expand on this please. It sounds like you slept thru' the night without any issue with the mat. It dipped below freezing overnight; the ground was frozen hard in the morning (apart from under my shelter) and all surface water, including some quite deep pools, were iced over. The water in my bottle was slushy and I had to shake it and remove the sippy top to drink it. I was using a UK Hammocks 3 season top quilt and wearing my clothes, including a Golite down jacket. The down jacket wasn't worn to provide extra insulation (I've used the quilt in my hammock down to -6C), but to prevent my back getting chilled when I roll over as the UK Hammocks top quilt isn't really wide enough for me to use it on the ground. I slept quite well, and the insulation provided by the quilt and my clothes were more than adequate. The best way that I can describe the performance of the mat in these circumstances is that it prevented me from being chilled by the ground, like being in a cool bed. I think that I would have been chilled if I had pitched on frozen ground though. MartinK9 and WilliamC like this. Really interesting to see some real world use. It seems to be quite common for them to break. I've been in touch with Zpacks (I can't be the only Brit who calls them Zedpacks, I just can't bring myself to say Zeepacks), and they're sending a replacement. I think that I've thought of a solution to reinforce them though, I'll share on here if it works. fluffkitten, Shewie and MartinK9 like this.